The midseason finale of The Walking Dead Season 6 made the unusual choice of reserving its bloodshed for 2016, even among characters who’d already looked like goners. We’ll have to wait until February 14 to find out who’s walker-chow, but one among the herd may look a bit familiar, if new photos are to judge. 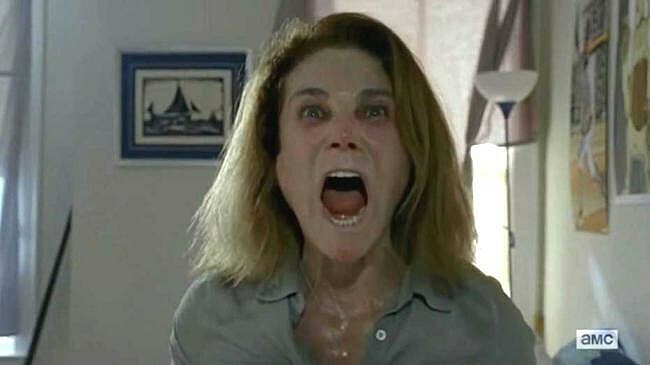 Take this one with a grain of salt for now, as we didn’t quite see the final fate of the once-bitten Deanna (Tovah Feldshuh) back in 2015, though it’s safe to say the character hadn’t long for this world after a couple hours’ worth of zombie fever. Deanna opted not to go through with a bullet to the brain, instead firing wildly at the crowd coursing into the home (strange thing to do to those slinking through the house below). Deanna’s male comic counterpart Douglas shared a somewhat similar fate (minus the initial bite), firing wildly before being overtaken by the herd, though we never quite saw his corpse reanimated. Is it safe to assume Deanna will make a return appearance? Who will be the one to ultimately put her down (again)? We’ll find out in just two weeks time, but check out the trailers for midseason 6 premiere “No Way Out” below.